I know of an upgrade we would like to figure out. A ramp for the dogs. We have one but it's almost impossible to use when you have to go down the stairs and they have to use the ramp. Need to find a sturdy ramp to hold dogs and person at the same time yet easily foldable for storage. Or find one goes along the side of the steps. We have to figure something out. We have 3 dogs. Little dogs but bending over gets old real quick. We purchased a Solvit Dog Ramp for our aging Rottie. Arthritis made it nearly impossible to get her up the stairs. The ramp is 17" wide so I am able to angle it from the top step giving good access to the 1st 2 steps and almost 9" on the top step. This allows us to get up the steps relatively easy while our dog can us the ramp. Didn't have a good picture from the side to show the angle and room at the top, but it works well enough to leave in place and still use the steps. 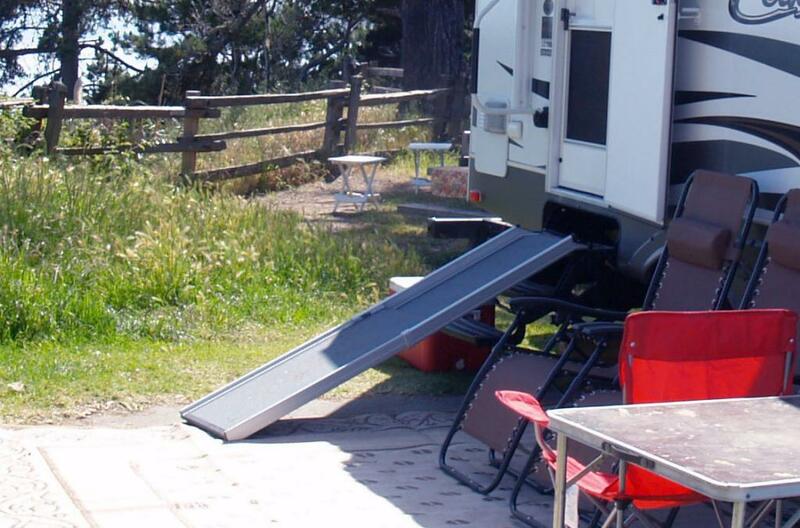 You'll find that most dog ramps will have a disclaimer stating only for animal use. Ours is rated for 400 lbs, so in theory you should be able to walk up it, but I have never tried. What I have found is the rated strength of the unit makes it very stable and at no risk of tilting even with the outside edge of the ramp on the edge of the top step. The unit telescopes down to 39" and fits in the storage under our bed. We bought a pet ramp from Pet Gear a couple of years ago to get our 14 (or so) year old rescue Bernese Mtn. mix into the SUV. It folds in three and is plastic but plenty tough enough for her 70lbs. Now we use it every day to get her in and out of the MH. At first she tried to go around it but now won't even try to go in or out without it. Our younger English Shepherd doesn't need it but now he zips up it. The things we do for our dogs huh? A couple of weeks ago my furnace quit firing. It would blow but not fire. Turns out that dust on the fan blades reduced the air flow enough to keep the flow paddle switch from making contact, thus not allowing gas to flow to the burner. In pulling things apart i noticed that there is no intake filter...hum? So, I bought some Filtreete filter fabric, cut a piece to fit the intake and screwed it behind the louvers. Should preserve the blower and be easy to clean. Much easier than dismantling the furnace to clean the fan. A while ago the FIL made me a New Rack/shelf To replace the little one on the Dog/House. I have to wait for spring to Finish. I'm going to use Teak Oil to finish. I bought a ramp for our little dogs but ours isn't that stable. says it's rated for 250 but I don't weigh near that and I wouldn't try it. Need to look for a better one. We found it difficult to get the dogs up and down the ramp while we try to go down the steps. We need a better plan. That isn't working. 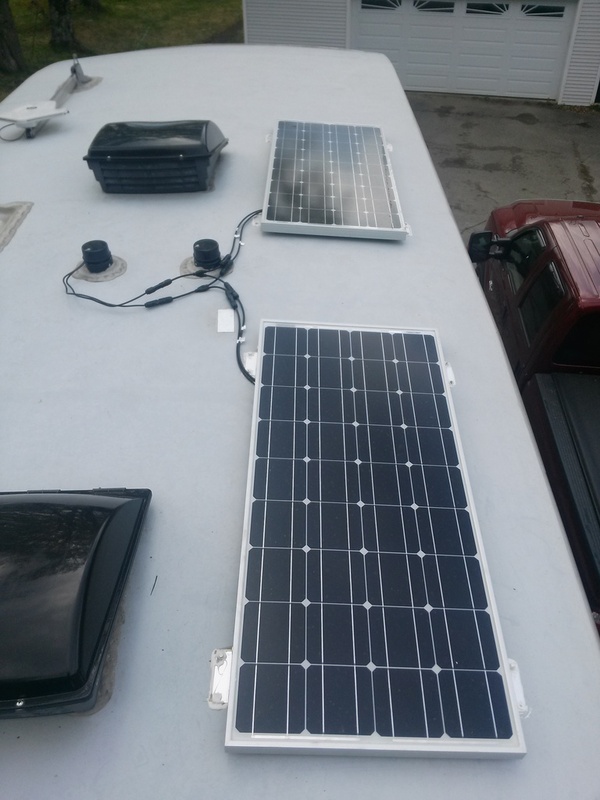 Two Renogy 100w panels on fiver to a Solar 30 controller via the gray tank vent. I can easily add one or two more panels if needed or desired. 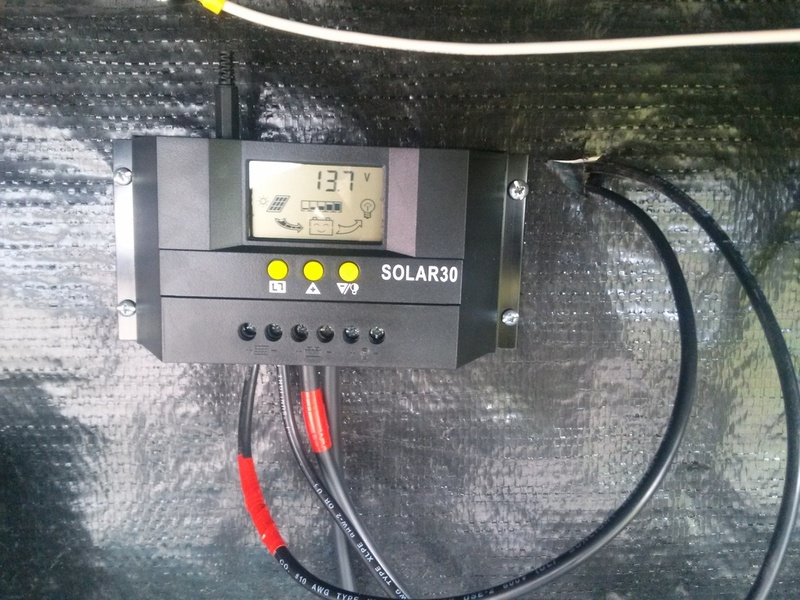 1st problem with my solar install is that the Solar30 is only showing .3 to .5 amps coming from the panels which should be more like 7 to 10 amps. I did have an MC4 on the roof that was very difficult to connect with the branch cable and still didn't seat fully. Could that be the issue? Should I use dielectric grease on those? Can an MC4 be easily replaced if it is faulty? Five of the 6 MC4s connected as expected, but that one just didn't want to receive the male and once it finally did would not seat fully. It is on the 20' 10AWG coming from the controller so I really don't want to replace the cable. I don't like that I can't edit a recent post. I may not have a problem as I was looking at the results of a fully charged battery bank while connected to shore power. I didn't realize that affects the amps shown coming from the panels. Looks like I need to turn off shore power and run the bank down somewhat, then check at high noon on a sunny day. But first check charging voltage as it will confirm your thoughts. If 13.5 or so it is in the happy place for the battery for both volts and amps. YEP, that's it. If you are at float voltage then the controller is going to limit the current. If you want to check the full sun current flow, then draw the batteries down a bunch (technical term) and wait till high noon. The voltage should creep slowly up to about 14.4 and then after an bit of time drop suddenly to the 13.X float point. My Gel cells float at 13.3, but 13.7 is in the range of acceptable float voltage. Latest upgrade is a new backsplash DH just finished installing in our Lexington 283GTS.